Ed Brown & Kent Hovind – Two Peas, Same Pod! – Kent Hovind v. Robert Baty – The Great Debates! Home→Ed Brown & Kent Hovind – Two Peas, Same Pod! 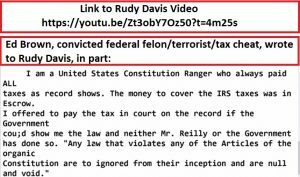 In a YouTube broadcast today by Kent’s leading YouTube promoter, Rudy Davis (aka LoneStar 1776), Rudy reads a letter from Ed Brown which was recently received and provides graphics of the text (see sample below). Ed’s letter is just another bit of evidence that proves that when people like Ed Brown and Kent Hovind ask people to “show me the law” they are not asking for information. They are asking for an argument designed to showcase their anti-government rhetoric and opinions, without ever reaching a reasonable conclusion regarding the real nature of their problems. Ed & Kent, and similar folks, are welcome to disagree with the law and voice their disagreements accordingly. However, they are not welcome to act contrary to the law, which they have done criminally, without consequences. As far as how “we the people” decide the disputed issues Ed & Kent like to rant on about, they have been tried and found wanting; they lost. If they ever come up with anything new, the courts will give due consideration to their argument(s). There are plenty of cases pending daily before our courts where such arguments may be presented. Old arguments, such as is common to folks like Ed & Kent, have been considered and refuted, rejected, so many times that the courts have properly determined not to spend any more time with in-depth legal analysis when they come up; and they do continue to come up from time to time. The courts have been dubbed such arguments “frivolous”, and making such “frivolous”, oft-refuted/rejected arguments should not be entertained. Ed & Kent know that. Ed & Kent are criminals, tax cheats among other things, whether or not I ever show them the law. It’s interesting that Kent and Ed also share a common plea to be provided a national venue where they can perform their schtick. In case you didn’t pick up on it, people like Ed (i.e., Kent, et al) simply reject as law, any law that is presented, that shows they might have been liable for income and/or related taxes under 26 U.S.C. In other words, Ed & Kent, et al, reserve to themselves the decision as what is going to be the law of the land as it applies to them. They don’t like the law. They acted out on their beliefs about the law; criminally. They were called to account for some of their crimes. They are still whining about that!